Back row L to R: Jim Calder, Alex Murphy, Alan Thompson?, ?? ?, John McMillan, Gilbert Montgomery, Campbell Lawson, Douglas Peebles, Jim Campbell, William Armour. 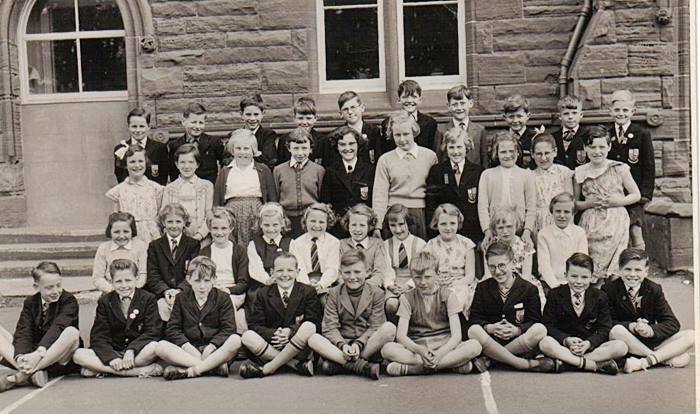 2nd row: Irene Cairns, Margaret Malloy, Margret Campbell, Sheila Mathieson, ?? ?, Jean McKenzie,?? ?, ?? ?, Marjorie How, Agnes Hendry. 3rd row: Helen Bruce, Georgie Laughlin, Moira Priest, Lian McKee, ?? ?, Annita Momford, Joan McDonald, Susan Johnston, Barbara Nimmo, Ann Frew. Thanks for that I've updated the names to that photo on the web page and also added big wull Ingram. He drops in noo and again and would have said. He's retired on the borders. Last edited by Hughie on Mon Oct 17, 2005 10:51 am, edited 1 time in total. Thanks for that I've updated the names to that photo on the web page and also added big wull Pettigrew. He drops in noo and again and would have said. He's retired on the borders.